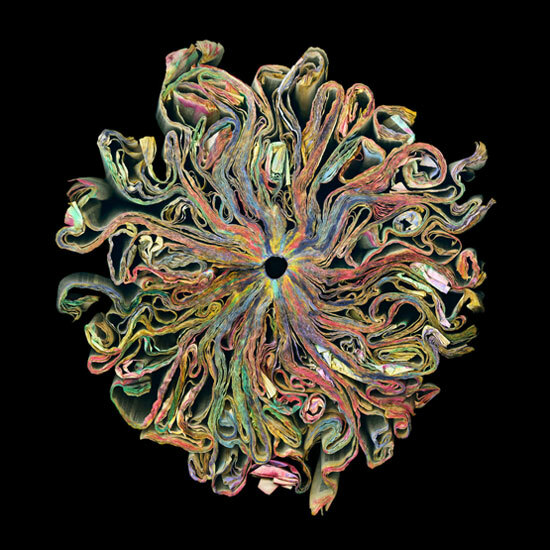 Cara Barer dyes and crumples old books to create these wonderful sculptures which she then photographs. Now through February 27th, 2016, you can see Cara's prints in New York's DUMBO at the Klompching Gallery. "The artist's creative process includes the transformation of outdated, abandoned and obsolete books into coiled, crumpled and sculptural objects. Following this labor intensive reconfiguration, she photographs them and presents the final artworks as large-scale pigment prints - lush in color, highly detailed and impressive."